It’s the end of an absolutely gorgeous early spring day in my medium-sized Central Maine municipality (pop. 6,183.) Warming mud, running water, lots of sun and, in my case, a freshly washed and clipped dog. We all took a walk in the woods and admired the new streams, let maple sap fall into our open mouths, did some outdoor chores while the kid enjoyed squishing his bare toes in the mud, and observed the snow existing in the loose, large-crystaled, SnoCone-like state it has just before it disappears. It simply doesn’t get any better. In my opinion, a day like today shows off the perfect state of municipal services in a town my size. Our roads, though not numerous, are good. Crime is low, as it is in Maine generally, and I happen to know one of our few police officers because we both have a child in the same cute elementary school. We wouldn’t have had a whole lot to do if we had chosen to go downtown instead of into the woods for our walk because there isn’t much of a “there” there, to quote Gertrude Stein speaking about a different Oakland. (I used to live in that different Oakland less than 10 years ago, and not very far from the sign in the linked picture. There might not have been much “there” there, but there was a whole lot more “there” than there is in this Oakland, if we’re talking about “there” in the more conventional, city-minded sense.) Our private well provided our water, our own septic tank takes care of sewage, and the fact that we have to bring our own trash and recycling to the dump (sorry! Transfer station!) gives us a slightly smelly but not-totally-unpleasant set of Saturday-afternoon outdoor chores to do together. However! Would this be a reasonable day in a larger town? Unlikely. Not only does a town with a higher population reduce the likelihood that everyone will be able to walk in the woods behind their house, or have a well and septic system to serve their water and sewer needs, but people who live in a larger town might also do so because of a difference in preferences. They might actually want to spend the afternoon downtown. Once there, they might want to walk around a park, or bring their children to a playground. They would expect their town to be well-lit for the activities they pursued after 6pm. Restaurants and retail establishments seeking to attract customers might have higher expectations for cleanliness and street repair than I do. 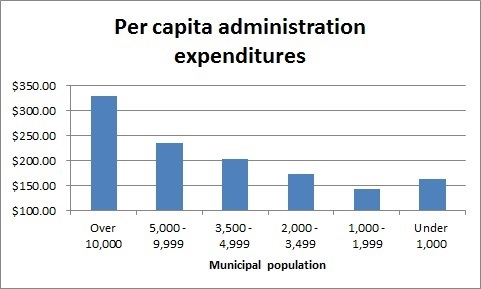 Let’s look at how this plays out in terms of per capita expenditures at different municipal sizes. The first variety of expenditure examined in the Fiscal Survey is General Administration. This category includes employee salaries and benefits, board expenses, legal expenses, offices, government buildings, and economic development. Do we see the concept of economies of scale in terms of per capita costs for local government administration demonstrated here? Not really. In fact, the per-resident cost of government administration decreases in linear fashion as towns get smaller – again, with the exception of the tiniest towns, where perhaps economies of scale are finally kicking in. Why might this be, that people in larger towns are paying more – not less -per person for local government administration? One reason for this difference may be that they expect different services from their municipal governments. For example, economic development. Almost all of the municipalities with more than 10,000 residents had some sort of economic development department (i.e., listed economic development expenditures in their budgets) while almost none of the tiny municipalities did. 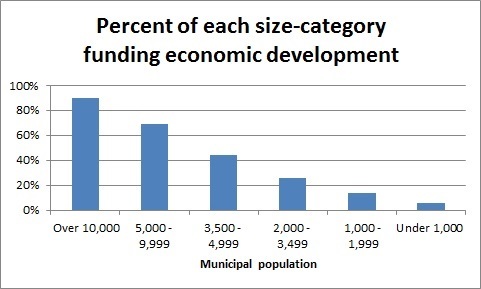 The town sizes in between demonstrated a nearly perfect linear relationship in terms of their likelihood of funding economic development activities. Town size relates to having – or not having – other kinds of services as well. As some of my interlocutors have noted, your smaller towns are not going to have large police departments. Police departments are expensive and where municipalities have them, they make up the largest part of the town’s public safety expenditures. (Other parts of the public safety budget include fire, EMS, street lighting, and related capital improvements.) However, many smaller have no police departments at all, instead contracting with county sheriff’s offices to provide local law enforcement. Again, the stair-step negative linear relationship, until we get to the tiny towns. 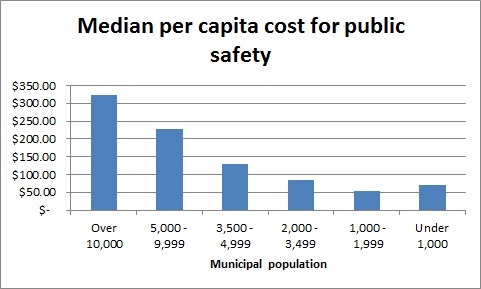 Just as in general administration, there appears to be a “floor” for public safety costs, and the tiny towns have run up against it. If there is, on average, some absolute bedrock expense below which you cannot reasonably go, then the smaller number of tiny-town residents are each simply going to have to pitch in a larger share in order to cover this cost. So what about the expenditures for the county law enforcement that covers municipalities which lack a municipal police department? Looking at those numbers, we find that the smaller town categories do indeed have higher county expenses than the larger town size categories. However, the range in median expenses in the “county expenditures” category was a lot smaller – chiefly because the overall expenses in this category were a lot smaller. 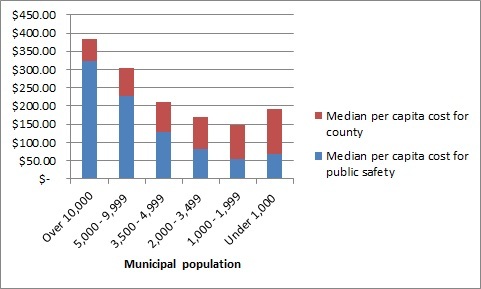 Thus, even when you add county expenses to municipal public safety expenses, the larger the town, it’s still paying more per capita for public safety. There does appear to be one place. Your savings are in public works. 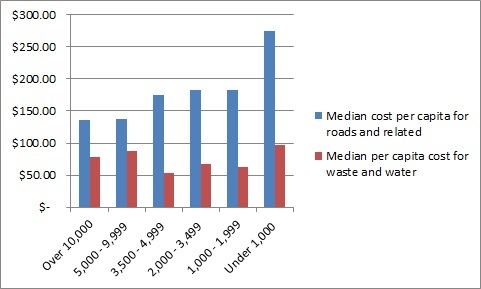 Ironically, even though the public works category includes water and sewage (as well as dump and recycling and capital expenditures), those costs are not strongly associated with town size even though larger towns are much more likely than smaller towns to provide municipal water and sewage services. Based on the lack of size effect, water and sewage seems like a really cost efficient thing for municipalities to offer. (Except on North Haven, where water and sewage is very expensive. Why should it be 50% more expensive than it is on Vinalhaven? Inquiring minds.) However, roads are simply more expensive per capita the smaller the town. More people are driving the same roads in larger towns, leading to an economy of scale on road repair, road salting and bridge maintenance. The economies of scale in road work seem entirely clear when we look at the negative relationship between town size and median per capita road and related expenses in town budgets. So does this disprove my central thesis that smaller is actually less expensive?